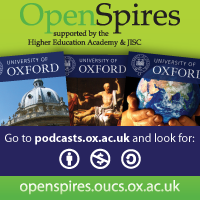 The OpenSpires project released hundreds of hours of Oxford digital learning content as Open Content Resources (OER) in appropriate ways via appropriate online platforms. The project has had global impact, as the resources are from world-class speakers and researchers. Oxford academic colleagues are supported in changing practice by becoming 'open content literate' to make informed choices regarding the materials they release and choose to reuse. The OpenSpires bid focused on supporting strategic institutional learning and encouraging cultural change. The project began in 2009 as a HEFCE/JISC OER pilot project . Follow on projects have continued and expanded this work. Our current OER projects are: Triton, Ripple, Listening for Impact and OER Impact Study. The outcomes will promote the sharing of effective practice that may inform and influence policy in other research-intensive institutions in the UK HE sector and beyond.